Earlier this week I was asked how to make money with SFI by a frustrated affiliate in my downline. His name is Bogdan. He lives in Romania and has been with SFI since July 2015. Bogdan reached out to me through my private (downline members only) forum in the SFI affiliate centre. Since few affiliates know how to make money with SFI, I posted a lengthy reply on the forum. I want to help my team succeed with SFI by understanding the full potential of the program. In addition, I encourage them to take action by offering some fun and rewarding incentives. Click here to read more about my monthly and weekly prizes for my SFI team. Building a business can be tough and frustrating at times. I know exactly how you feel because I have been there. You are doing better than about 85% of people simply by not giving up after six months. The key now is to commit to get into the top 5% by turning your persistence into success. 1. Stay committed to SFI business building services such as S-Builder Co-op and PSAs To Go. Treat those services as a fixed expense in your business. I have a permanent standing order for S-Builder Co-op. That allows me to buy PSAs To Go (i.e. new referrals) for just $2 each. It is true that most people who join will not do much. Even with all the great things on offer at SFI, plus my incentives and competitions, most people do little. That is true in every affiliate business. The key is not to focus on those who do little or nothing. Instead, set an example of leadership and focus on those who take action and follow you. Some of my top performers came into my team through the S-Builder Co-op. If I had cancelled my standing order I would not have recruited them. One example is my affiliate Hans Bergmeier, who regularly wins a prize in my monthly VP contest for the five most active members of my team. He was referred to my team thanks to the S-Builder Co-op. In the end, my “fixed expense” standing orders are off-set by my profits from my team. But only because I did not give up after a few months. 🙂 So, hang in there! 2. I built my team by offering competitions and incentives BEFORE I had a team. I have done this now several times in several different programs, but SFI is the BEST program for this kind of incentive because of how well the program is set up. I sell two kinds of products on my blog, Top5Programs.com. First, I sell business services and information products for Internet marketers in general. Second, I sell online-business products specifically for SFI affiliates. NOTE: You do not have to limit yourself to selling business products and services. You can sell almost ANYTHING and generate sales by giving away Rewardical digital tokens. QUESTION: What local products could you sell as an ECA on Tripleclicks? How about local craft products that are easy to pack and post, and yet could be popular with a global niche market? Here’s an idea for SFI/business related products: PLR articles. (PLR = Private Label Rights. It means people buy the RIGHT to edit and publish the articles under their own name when they buy them.) PLR articles help bloggers and others to add content to their blogs. I sell a range of PLR article packs including a pack specifically for SFI members. What if you don’t want to write the articles yourself? Hire and article writer to write some articles for you for a one time payment. Now offer the articles as a PLR article pack for $10-$15 per customer. Do that 10 times and you will have a nice range of PLR article products. Do it 100 times, reinvesting from profits, and in time you will have a nice little online business. I promote SFI on this blog, Top5Programs.com. I also use Leadsleap to promote my squeeze pages. My list building squeeze page for my SFI recruiting campaign. A unique, branded squeeze page makes you stand out from the crowd and builds name recognition. And yes, I use safelists, BUT I do not promote SFI directly. Instead, I use a UNIQUE squeeze page to BUILD MY LIST thanks to the Trafficwave autoresponder service. 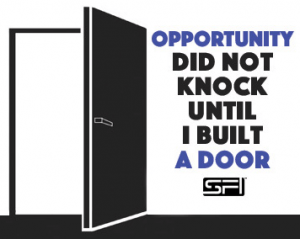 Here is my SFI list-recruiting squeeze page! I hope my comments help you to see the potential that is in the SFI affiliate program. What I have shown you is how I make money with SFI. SFI offers many opportunities to make money, so the question, how to make money with SFI has many different answers. Other successful SFI affiliates probably do things differently. The key is to decide what works for you and then stick with it. P. S. If you want to learn more about how to make money with SFI check out the 4th edition of my popular e-book, SFI Affiliate Success Handbook – I’m giving away 103 Rewardicals with every order! Ukpeli James Wins $100 In My Tripleclicks Gift Certificate Prize Draw!